Ammonia, a chemical compound of nitrogen and hydrogen is produced using naphtha, steam and air. Feedstock naphtha is the source for hydrogen and atmospheric air for nitrogen. (MDEA) in the CO2 Removal Section and sent to Urea Plant as one of the raw materials for Urea production. The remaining CO and CO2 from the process gas is converted to CH4 in the Methanator. The processed synthesis gas is compressed and sent to the catalytic converters (S 200 and S 50) where Ammonia is produced by the catalytic action. Synthesized Ammonia is separated and sent to Urea Plant as raw material and the remaining quantity is refrigerated and sent to cylindrical storage tanks. 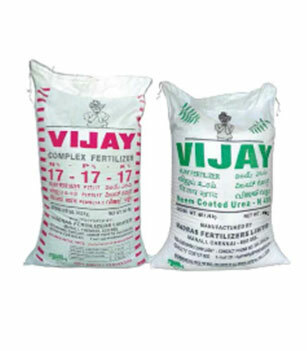 Urea is produced by reacting Ammonia with carbon di oxide (obtained from Ammonia Plant) in stainless steel lined reactors at 215-220 kg/cm2g pressure, using the technology of UTI total heat recycle Process. The high efficiency Reactor has a conversion of CO2 to Urea of about 76% per pass. After flashing and decomposition at medium pressure, an additional Carbon-di-oxide is injected into the Medium Pressure System followed by flashing and decomposition at low pressure and then concentration of urea solution at vacuum. Further concentration takes place at evaporators at the top of Prill Tower. Here the hot Urea solution sprayed down in a 210′ cylindrical concrete Prill Tower, counter current to a stream of cold air with a free fall height of prills for 170′. The Urea solidifies into small white Urea prills. The prills are then passed through a Fluidized Bed Cooler (Prills Cooling System) to reduce temperature and fines thereby improving the quality of the product. The entire off gas is absorbed in a bubble cap tray absorber and then recycled to the reactors. The chloride-free effluent is treated in a Hydrolyser Stripper and the contents are recycled fully. The treated water is used for demister washing. The product is sent through a system of conveyors and elevators to bagging streams. There it is bagged and shipped as Urea product. Reaction of liquid Ammonia and Phosphoric Acid to form slurry of mono and di ammonium phosphates in Pre-neutralizer in two trains (A & C Trains). In the other train (B Train) reaction is carried out in pipe cross reactor installed inside the granulator and dryer. Mixing of the slurry with other feed materials: Liquid Ammonia, Urea, Muriate of Potash, Filler and re cycled NPK granules. Solid raw materials are fed to the system through the modern J&N Weigh Feeders (with Programmable Logic Control device) which maintain accuracy according the set load. Mixing is done in the `Granulator’ or `Blunger units where the fertilizer granules are formed. Drying of the granulated material in a rotary dryer. Separation of granule produced by screening followed by cooling, coating & polishing of the granules and product bagging. MFL produces four grades of N P K fertilizers viz. 17 17 17, 19-19-19, 20-20-0 and DAP 18 46 0. One set three bagging streams for bagging Urea and another set of four streams for bagging products from NPK A and B Trains are provided in Bagging and Shipping Plant. A separate set of three bagging streams are available for bagging the complex fertilizer from NPK C Train. The bagging streams are maintained in humidity free atmosphere by Bry Air System since NPK complex fertilizer is hygroscopic in nature. The Bagging System consists of a high precision machine (Jashubhai Richard Simon Ltd, Mumbai) with an accuracy of plus or minus 10 gms from the set 50 kg per bag of fertilizer and an auto-bagging mechanism. The bagged product is moved in conveyors for loading trucks or wagons to transport to various warehouses / dealers.